Assisted care centers, independent living centers and senior living communities are popping up all over the country, and part of the draw is the social aspect of the residential communities. Senior Living Centers Digital Signage with Arreya will seamlessly keep every resident informed about events, bus trips and other opportunities to get out and be a part of the group. Add monitors to elevators, hallways, cafeterias and share your personal, secure Arreya URL with your residents. As children are moving further from their senior aged parents, elderly look to retirement communities to build social connections from others their age. 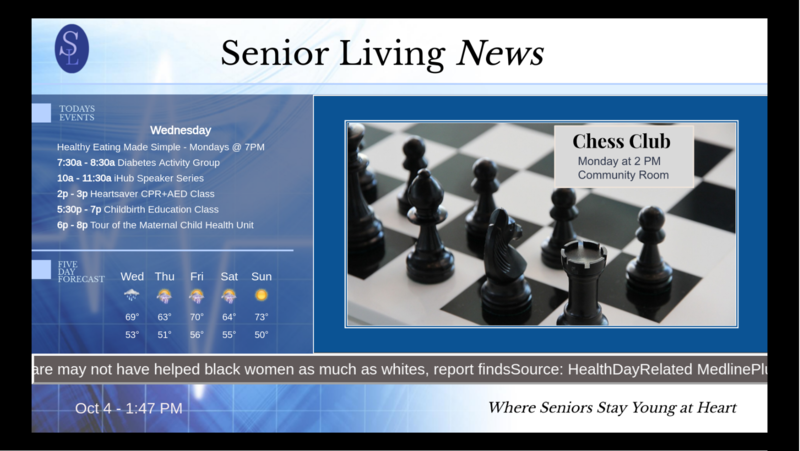 Arreya Digital Signage keeps retirement community residents informed and up-to-date on community events. This is especially true when 25%-50% of retirement community residents suffer from obvious hearing loss. 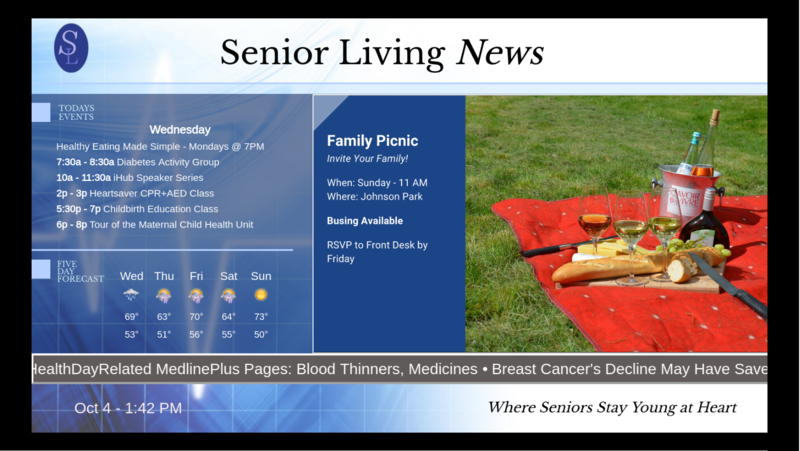 This makes digital signage the perfect solution to communicate with residents in your senior living community. Most senior citizens can still see well enough to watch television, and in digital signage, there is no maximum size for your display. Position screens where the residents eat, in elevators, and in entrances to hallways and buildings to gain more awareness. Activities and Entertainment – Musicians scheduled to perform, bingo, craft times, card club, day trips and group vacations. Keeping seniors active will keep their mind and body well. Menus – Most senior living communities have dining room service for at least 2 meals per day. Keep your residents informed about the menu options a few days in advance. Safety Information and Resources – How to call for help or services from their rooms or apartments, organizations that provide rides for appointments, and when the visiting nurses will be around for blood pressure checks. Cleaning and Laundry Schedules – When can each area of the community expect laundry services or cleaning help. How do they sign up for services if it is optional. 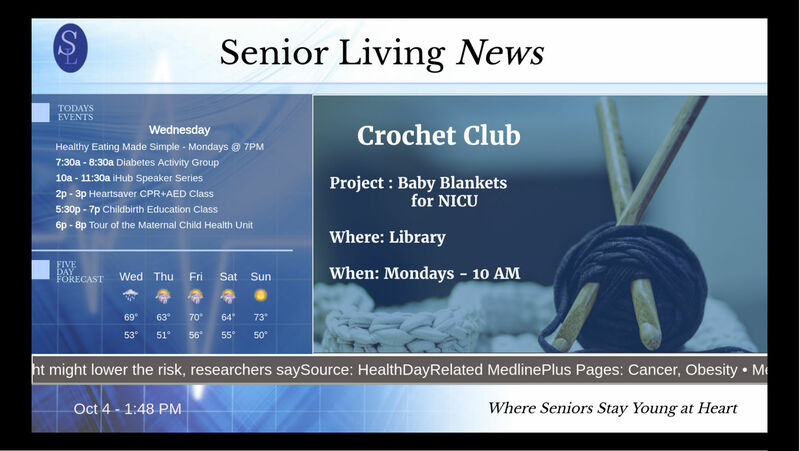 News Feeds – Run a ticker across the bottom of the screen with the latest news and keep your residents informed. Birthdays and Anniversaries – Special days are important, even as your residents reach their golden years. Make their day more special by letting everyone know they should wish them a great day. Staff of the Month – Let your residents vote for their favorite staff members and give a sentence or two about why they stand out. Digital signage saves money in time and printing costs. 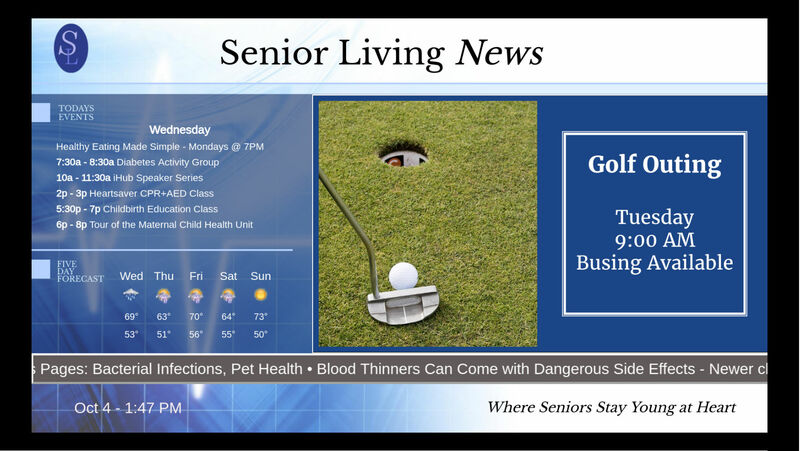 Senior Living Centers Digital Signage content can be remotely updated on a daily basis to keep retirement residents informed with the latest information. No need to run the halls to change out posters or informational flyers. Arreya Digital Signage Suite allows for updates from your online, secure subscription, just log in from any computer. You can easily create a channel that plays your display to feed to your residents’ rooms with Arreya Digital Signage Suite. It works very similar to the information channels on televisions in hotel rooms. Your residents have a television in their room anyway, so make it a portal for all the information you want them to know. If you want to add digital signage to your senior living community or assisted living center, contact Arreya at 319-294-6671.